When you enter The Treasury on The Plaza, you are transported through time to a place where memories are born and dreams come true. Located in the very heart of St. Augustine, Florida’s charming downtown historic district, The Treasury originally opened in 1927 as the area’s central bank. 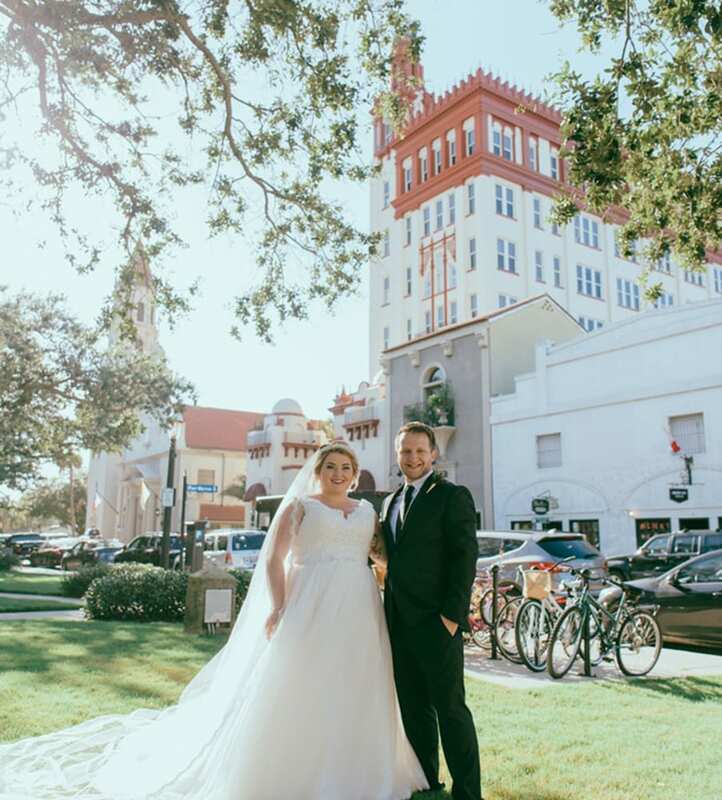 The building was recently remodeled to become a premier destination for St. Augustine weddings and events. 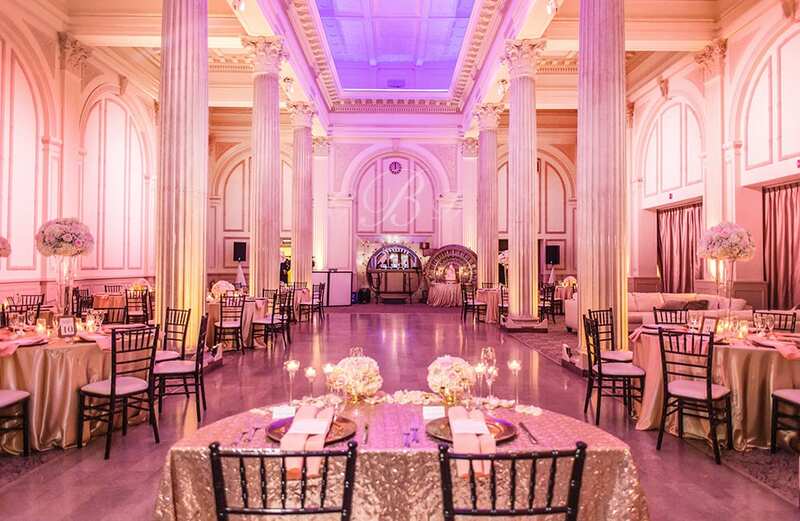 The opulent venue spaces embrace the elegance of the building’s historic past while providing the sophistication and luxury of modern conveniences. We invite you to celebrate your dream wedding ceremony and reception with us, and make history at the most treasured wedding venue in St. Augustine! EVERYTHING YOU NEED TO KNOW TO PLAN YOUR SPECIAL DAY! 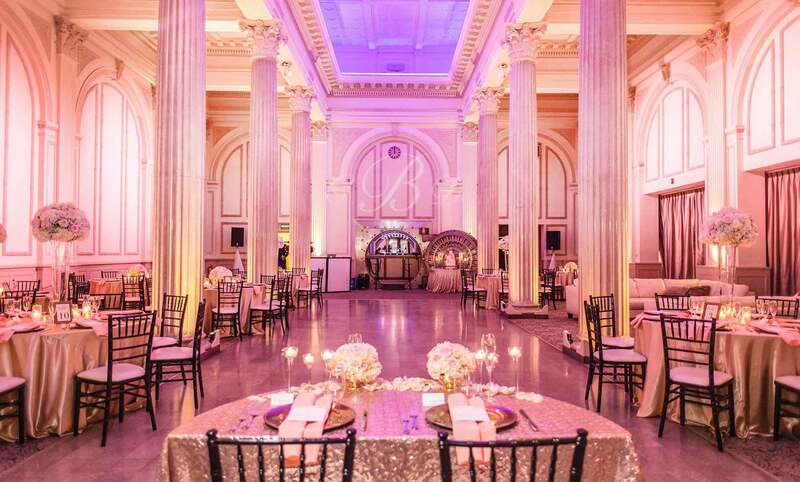 Celebrate your event in the midst of history, elegance, and luxury. 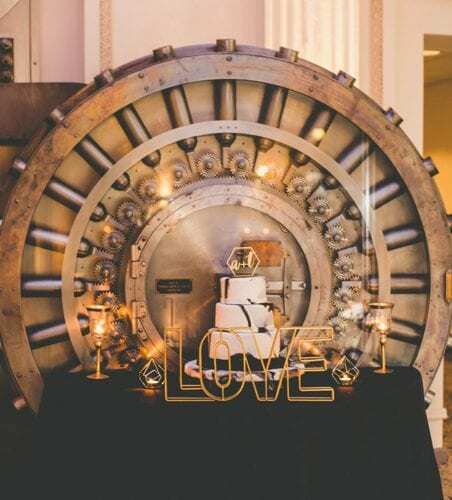 With elaborate architectural details, stunning high ceilings, and a historic Vault Bar created from the original 1927 bank vault, The Treasury on The Plaza is ideal for couples looking for unique St. Augustine wedding venues, or nearby Jacksonville wedding venues. State-of-the-art lighting technology transforms the venue from classic, to chic, to high-energy nightclub at the touch of a button. Our Grande Ballroom is flexible to accommodate intimate wedding ceremonies and receptions of 50 people, or extravagant seated banquets with comfortable seating for up to 250 guests. 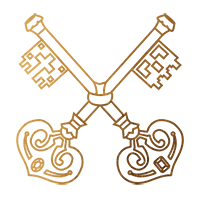 Click below to see our St. Augustine wedding packages, learn more, and get started planning your event! Learn more about our venue layout, history, location, and bar packages. 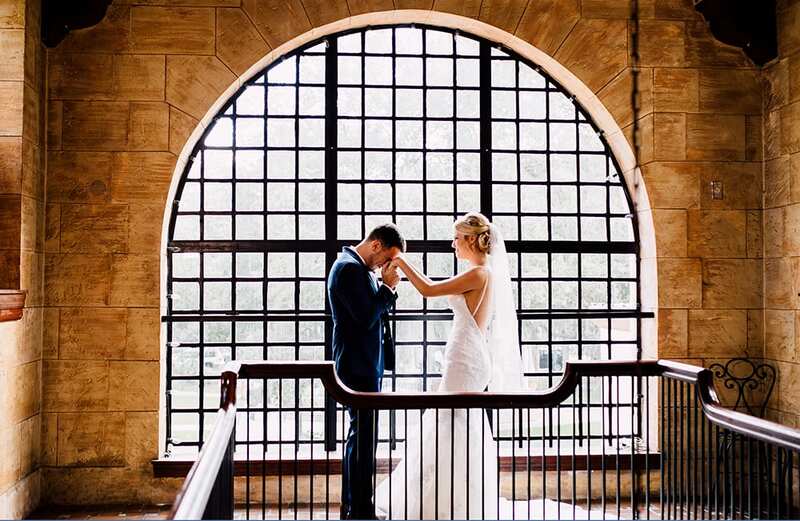 View our venue floorplan, learn more about our wedding ceremony and reception locations, as well as our other event spaces. The Treasury on The Plaza is Saint Augustine's first and only skyscraper dating back to 1927. Take a trip back in time at 24 Cathedral Place! St. Augustine is our nation’s oldest city! With a wealth of history and culture--not to mention our beautiful beaches--it is the ideal location to host your event. The Treasury on the Plaza is known for it’s impeccably curated alcohol selections for weddings and events. Download our bar packages. 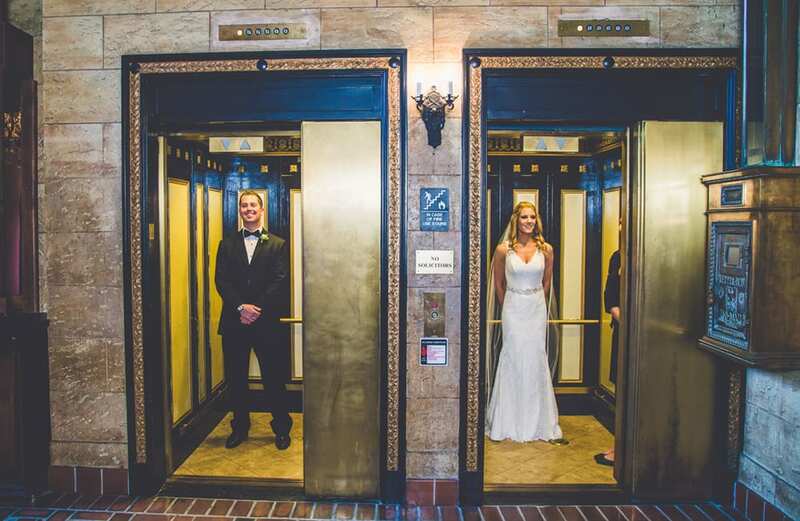 "Hands down, one of the best decisions we made during our wedding planning journey was booking The Treasury. During our tour, my husband and I immediately fell in love with the venue. The space is breathtakingly beautiful! Nothing compared to what The Treasury offered: the vault bar, high columns, in house uplighting, groom and bridal suite, exchange gallery, and the whole venue exclusively ours on our wedding day? Sign us up! Sold! It was truly a magical day that not only made my husband and me feel special, but our bridal party and wedding guests did as well! The icing on top of the cake was working with the venue staff. They went above and beyond to accommodate all our requests and always did it with a cheerful attitude and smile. Our wedding was an all around amazing experience. Thank you to The Treasury for making our wedding day magical"! 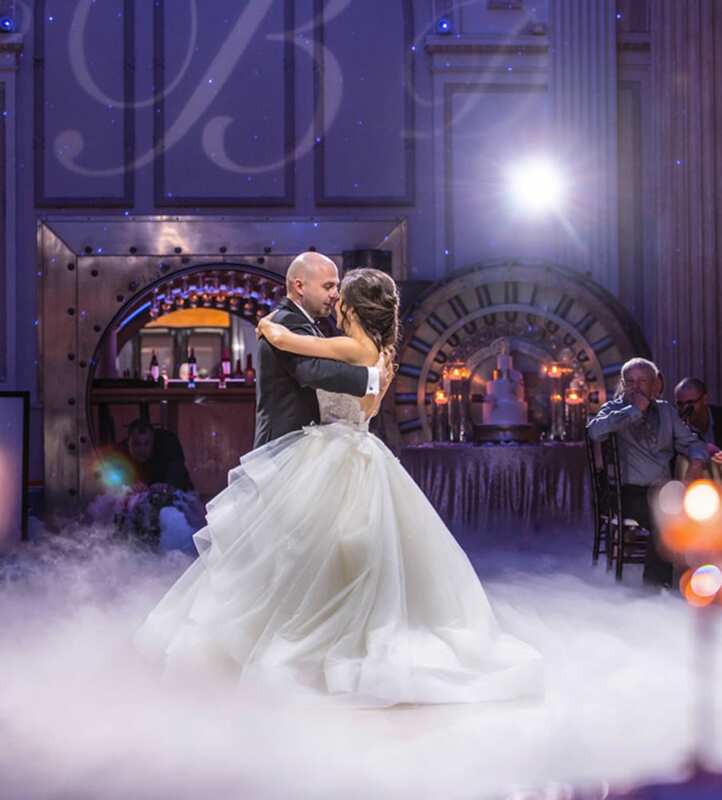 "The Treasury was the ONE AND ONLY venue we went to see and knew instantly we wanted to get married there. Allison gave us our initial tour and was so incredibly sweet and informative. Lyndsey became our contact there and she was simply amazing! She handled everything promptly and was very responsive to all questions leading up. She was professional, accommodating, kind and fun! Our wedding turned out PERFECT. Our guests were astonished with the beauty of the Treasury and the amazing staff! It was literally a dream come true and we can’t thank everyone there enough for making our night so special!" 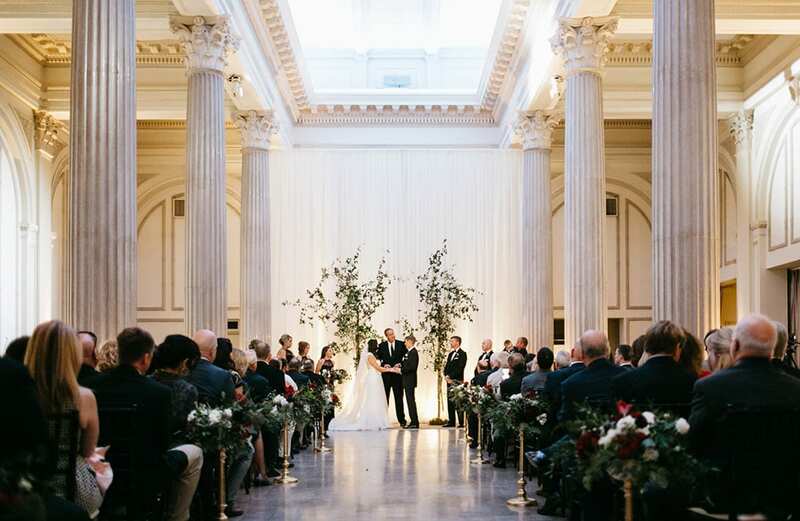 "From the moment my husband and I walked into the Treasury on the Plaza, we were overcome by awe. The venue is absolutely breathtaking! The staff and service was equally as amazing. What we appreciated most was that they only ever host one wedding per day. Other venues sometimes shuffle you in and out, only allowing you a short window for your ceremony or reception. The Treasury gave us a full 11 hour window! Brandy was always accessible, quickly responding to emails, calls, or text messages. The day of the wedding was perfectly planned and executed according to our requests made during the 30 day walk through planning meeting. On top of it all, you can tell that much thought went into the layout of this venue. While it is an old bank, every sq ft was maximized and converted into usable space. The Venue sold me, but the bankers lounge sold my fiancé! It's rare that you find a venue that caters to both the bride AND the groom. 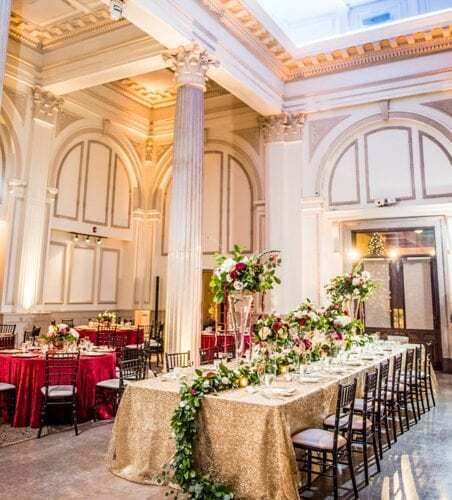 Thank you Brandy and team - I can not imagine a more perfect wedding than the one you hosted for us at The Treasury on the Plaza, our friends and family will be talking about our wedding for years to come!" "As a Mother of the Bride, you want this day to be one of the most amazing days that your child will always remember. Well at The Treasury this is completely true, because this venue and the team we worked with were amazing! From the everyday questions I had, to just feeling like there was something I needed to do, they were there for me. We were blessed to have Lyndsey working with us. She exceeded my expectations and always made herself available either by e-mail or cell. One week after the wedding we still had wedding guests giving rave reviews about this venue. If there was ever a glitch not one of our guests new about it. If your planning to have an event please consider this venue. Thank you Lyndsey and all your staff for all you did for us!" "The Treasury team is expert on all levels. From start to finish, the level of customer service and knowledge shown by The Treasury staff exceeded our expectations. We booked our venue after a one-on-one guided tour. Bridey, our event manager, was extremely professional, friendly, and accessible. As the wedding day approached, Bridey went as far a giving my mom and wedding planner her personal cell phone number so that any need could be answered immediately. My husband and I had special bar requests and they were all graciously grated by Brandy, the Director of Operations. Bridey and Brandy took extra time and thought into meeting the needs of our every desire, including adding our favorite bourbon to the bar, sourcing my favorite wine, and assisting in curating our signature cocktail. Small touches like this made my husband and I not only feel like we were their only bride and groom but solidified that we had made the absolute best choice in venue selection. The commitment to service for every one of our guests was what stood out and made 'the absolute best wedding I've ever been to' the common theme we heard among guests. We are so grateful to the Treasury family for welcoming our friends and family into their beautiful space and treating us to an enchanting seamless night of celebration."